As Seen in "Obscure Sports Quarterly"
I've obviously got a fondness for weird, foreign, or alternative versions of popular sports. I'm typing this while watching Brazil vs. Cuba in the World Baseball Classic from Fukuoka, Japan. Maggie and I went to a Yomiuri Giants baseball game in the Tokyo Dome last summer. 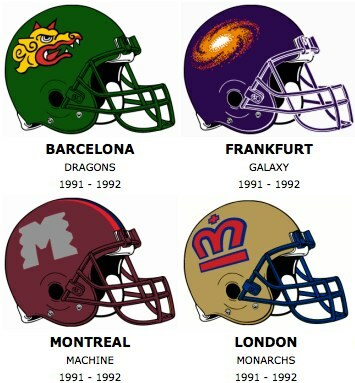 And I'm reminded of the great summer of 1991, when my college apartment-mates and friends, with a bunch of beer, would gather around our little TV tuned to the USA Network, on Saturday, Sunday, and Monday nights, and watch The World League of American Football. A league of European and North American teams playing American-style football, full of not-quite NFL players, and good-in-college hopefuls, and maybe some freaks they found working in the docks and coal mines of Estonia (I dunno), they played in cities where the fans sort of obviously viewed them as the carny-spectacle that we did, and who were drinking more in the stands than the 22-year-olds watching from Iowa City. I vividly remember the major sponsors, KFC (i remember some value-meal themed around the "world bowl"), and Official Airline: Delta. David Letterman made fun of them. I own a Barcelona Dragons hat, still. If you know me, you know that Baseball is my favorite sports-thing, and that I don't watch much NFL or college football anymore. The old days were better, I tells ya.